As folk who follow my blogs know, I frequently post tributes concerning people who died just prior to my posting. Some are about people I have known who have affected my life, and some about someone, usually a celebrity of some sort, who I did not know personally, yet who have affected many. I try to avoid the negatives and focus on the positives, realizing no-one is perfect, and often try to dwell on the legacy they might leave. One such person is John McCain, a formidable character, who was both enigmatic and controversial, both loved and loathed and one that could both divide and unite. While I felt a blog post was in order, I was reluctant as there were aspects of his life I did not like and, significantly, people are using his death as an excuse to make political statements and criticize Trump, a person who he did not see eye to eye with. Reflecting on their personalities and policies it is not difficult to see why. Some of the reasons are contained in this “John McCain: Five times he clashed with Trump” article. I have little doubt he played a role in getting the damaging Mueller investigation underway. As a Trump supporter, I got it he saw in Trump one who reacted against criticism and was prone to flattery. McCain was a war hero, whose family served with distinction in the military, going back to the American War of Independence. He spent five years as a prisoner of war, which no doubt had a bearing on his later politics, which was decidedly Neo-con and anti-Communist. He was a maverick (and proud to be one) and was someone who stood up against his own party (latterly that included Trump), notably and most recently when it came to health care reform. Trump, in contrast, dodged military involvement and is often seen as being bad. It is regrettable that Trump’s own tributes were dismissed as insincere, when it seemed to me he acted with due decorum, including doing the sort of ‘official’ things we would expect from the President of the USA. In later life McCain was diagnosed with an aggressive form of brain cancer but gained admirers for pressing on regardless. He remained to the end a man on a mission, who was in a rush to achieve his many goals. My point in writing is not to paint John McCain in glowing or otherwise terms but rather to point out that he was a mixture of good and bad, like the rest of us. That he made a mighty impact on American life and world events is without question and in his own peculiar and unique way showed some of the best of American life. Posterity may show where that balance lay and like us all he will face the One who alone is qualified and able to judge fairly. This is not the time to make political capital. While I dislike the title, “McCain appears to criticize Trump in farewell message to the nation”, I like this message he requested be read out after he died. I believe it showed a side to the man that is worth remembering. But there is a twist in this short, what is in the main, tribute and relates to my earlier reticence to post this. John McCain was a controversial figure who attracted enemies, right up to the end, which is something in my small way I can relate to. I would like to think that before I die I can be reconciled with any who I have anything against or have anything against me. In any case they will be invited to my funeral. It appears, just like with his farewell speech, John McCain had given some thought concerning his funeral arrangements. Past presidents, Bush and Obama, have been invited to give a speech – a nice touch. However, present President Trump has been told he is not welcome. I find that particularly sad. 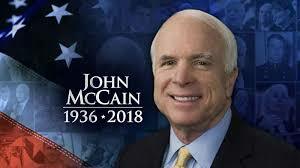 Update 02/09/18: The funeral of John McCain’s is now over and it was a grand occasion with all sorts of tributes made to a man people had good reason to honour. Many of America’s good and great were able to pay their respects to this remarkable man. This was epitomized in a speech made by ex-President Obama, which was fabulous and demonstrated how he could reach his ideological opponents. On the flip side was the non invitation to his former presidential running mate, Sarah Palin, which seemed to dispel the myth of him being a unifying character. History and the Day of Judgement will reveal what his true legacy was (as it will for all of us). Meanwhile, rest in peace John McCain.